A week next Sunday a beautiful art deco venue that was once a favourite gathering place for the old East End community could well become a flashpoint for violent divide. 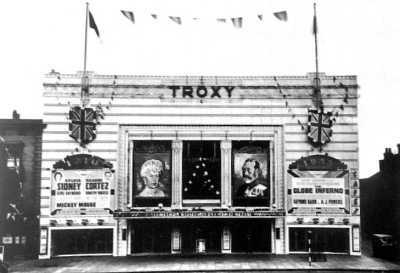 My old friend Caroline Merion, the veteran local historian and Labour activist who is currently recovering in Mile End Hospital after a fall (get well soon, Caroline), predicted three years ago that the former Troxy picture palace was falling into the wrong hands after decades of decline. Built with an ornate staircase and dazzling chandeliers, it opened in 1933 and locals loved the Hollywood glamour it brought to Stepney’s Commercial Road. The first film shown there was King Kong; the last, in 1960, was, aptly perhaps, The Siege of Sidney Street. From 1963, it was used as a rehearsal venue for the Royal Opera House, then, from the Eighties until 2005, as a Mecca bingo hall. Now fully restored, it is an event venue for all seasons. Its current owners, Deepak and Mohit Sharma of Walthamstow-based Ashburn Estates Ltd, have invested hundreds of thousands of pounds in their business venture. And they make no bones that that is exactly what it is. For over the past three years, the Commercial Road venue has played host to weddings, cage fighting, a Miss England contest and a Ukip party conference. As long as guests are willing to pay up, they’ll hire it to anyone, it seems. Even, sadly, to the organisers of a conference on June 20 featuring these lovely open-minded chaps: Bilal Philips and Hussein Yee. I urge you to read this link on Harry’s Place for a detailed background. As well as attracting their own hordes and, no doubt, secret squirrels from the intelligence services, there’s also likely to be another couple of groups mingling outside. One will be the thugs from the English Defence League (who are reportedly sizing up Tower Hamlets for their next demonstrations), the other from Unite Against Fascism. They don’t like each other very much and the mingling is most unlikely to be of the “How nice to meet you” variety. Those worried about what could happen have written to the Troxy’s owners to ask them to cancel the booking, so far without success. As businessmen, they’re only likely to listen with their wallets. According to the latest accounts for Asburn Estates, they made a profit of £96,000 in 2008/09. Its turnover is below the £5.6million threshold required for disclosure to Companies House, but its bank balance as at March 31, 2009, was £38,765. Clearly, the owners like money and I’d imagine they’d need more to satisfy their appetites. So here’s an idea: why don’t our council leaders, who profess to be deeply committed to the concept of a harmonious “One Tower Hamlets”, simply tell them that if this conference goes ahead, they will not attend any other event at the Troxy? And that includes the Tower Hamlets Muslim Staff Forum gala dinner that’s held there every year and which is partly funded with public money. That way our leaders show leadership and our businessmen show they care a little about the area in which they operate. Thanks to a comment below by TowerHamletsWatch regarding his post here, we learn from the current edition of East End Life (that’s the council’s free-sheet; it’s never delivered to my corner of deepest Bow) that the owners of the Troxy, supported by Cllr Abdal Ullah, have signed up to the borough’s No Place For Hate campaign. The words “put”, “money”, “mouth” and “or not as the case may be” spring to mind.